Welcome to the first edition of Calais Migrant Factgasm, in which I quite metaphorically round up every piece of internet about the Calais migrants and incarcerate it in the detention centre of my blog. Featuring news from the past week and analysis of Eritrean migration vs big business and the lorry driver protest organised for this coming Saturday. Enjoy. One of the squatters got a busted leg. The police tried to catch the youths, but they got away. I think it’s safe to say that these youths were fascists. Like parasites, wherever there are migrants, there are fascists who come to prey on them. Why? Boredom combined with empathy-erosion, probably. Chucking a Molotov cocktail and then running a car chase with the cops must be pretty exciting. And these youths just can’t see that the problems faced by the migrants are exactly the same as the problems they face: no jobs, no money, boredom and a sense that their life is going nowhere. A baby. The baby was taken to hospital, the other nine were taken for questioning, detention and perhaps deportation. A baby. Who’s to blame? The migrant parents for being so irresponsible? The French authorities for not caring for the innocent? The British authorities for closing the border to the innocent? The world order that creates political situations and conflicts in which ordinary people with families feel they have to flee their homes in order to build a better life for their children? Hmm. Because that will solve the problem of war, poverty and starvation in Eritrea, Sudan and Afghanistan, won’t it? Every Sunday for the last two years, migrants and their friends have enjoyed a game of football in a park in Calais. Now, the mayor is going to court to stop them, sending in the police and bailiffs. If I was more of a conspiracy theorist, I’d think this was a Machiavellian move on the part of the mayor. If the migrants don’t take out their frustrations by kicking a ball around a park, then how will they? Riots? The mission will be based in Paris. They have seven months to work on this and they’re spending an entire three days in Calais, before squirrelling back to their ivory towers. Baffling. If only that were true, I bet thousands would try it. And succeed. Many of these people have already survived torture, bombings, slavery, crossing the Saharan desert, crossing the Mediterranean in sinking ships, four different kinds of Mafia and several Italian and French prison cells. They’re not going to be intimidated by a bit of swimming OR casual fascism on an internet message board. “We are human beings”: The treatment of immigrants in Calais, France by Petros Tesfagiorgis. Published on the 22nd of September, on Eritrean news network Asmarino. The irony is while Europeans are complaining of the number of refugees entering Europe, they don’t hesitate to encourage their private companies to do business with the repressive regimes in Africa who are the underlining causes of flight of refugees. The West is gaining far more lucrative profits from the third worlds than they give back in terms of aid and giving sanctuary for refugees. For example the British Government has encouraged a number of mining companies to invest in Eritrea and a visit was recently led by a British Government official to facilitate contracts. A mining company named London Africa Ltd has recently been granted a license covering over 1500 square kilometres of Eritrea. They have joined companies like Sunridge Gold Corporation and Bisha Mining Shared Co (BMSC). This is a real Gold rush like “El Dorado” in contrast to the asylum seekers desperately seeking safety in European countries. Just a brief insight into the nuances of a migration that is usually presented (by government and media) as lazy scroungers running away from their homes to sponge off the beneficent welfare state of Britain. This simplistic narrative conveniently hides our role and the roles of our governments and our government-supported businesses in the creation of these desperate migrations. The BIG Report: The Lorry-drivers’ Perspective. That is proper unfair, pushing the blame for the conflicts of the political classes onto a different set of the innocent working class. Divide and rule. Wednesday, 24th of September, BBC: Lorry driver tells of risks of driving through Calais (Video). Hmm. Interesting. I can empathise with these lorry drivers, who are just trying to do their jobs without killing anyone or getting fined. Wednesday, 24th of September, Express and Star: Lorry drivers are being treated as “scapegoats” and penalised unfairly as the illegal migrant crisis worsens. Is it about managing EU borders better? Or is it about addressing the causes of these migrations? But then we might not have such cheap oil, we might not have such cheap consumables and we might not have such pliable markets for our exports. Tricky one. To stop a driver being injured or worse. To stop Isis terrorists from re entering this country. To stop Ebola being transported into this country. To stop unchecked criminals from entering this country. To stop rapists and child molester’s into this country. To stop drivers being fined for clandestines being on their trucks. To show the government your not happy about uncontrolled immigration. To show the government your not happy being in the European union and it ruling our country with tin pot human rights laws. NB: I’ve left the grammar exactly as the original writer intended. I think it’s funnier that way. NBB: It’s not that funny. 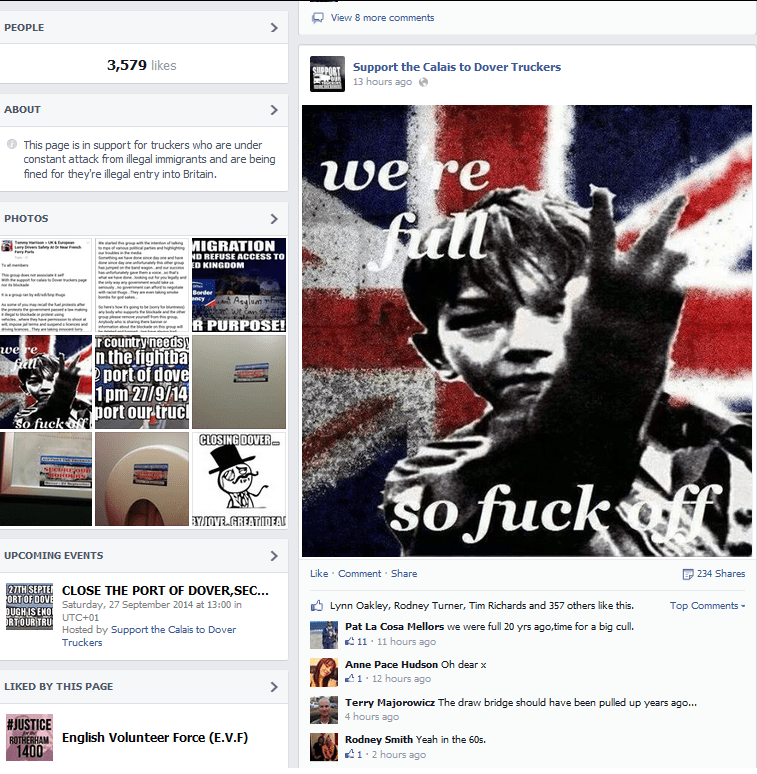 The Facebook group has been described as having links to far-right groups in the UK and are supported by Sauvons Calais (Save Calais), a French collective notorious for their “war against immigration and pro-migrant associations”. A counter-protest by leftie groups has also been organised… Can’t see this going badly at all, can you? Divide and rule. * Please note: Although some of this blog post might smell funny, this is NOT a parody. This is happening, here, there and all over the world, right now, a witch’s brew of UK and EU border and foreign policies. It’s really easy to stand in solidarity with other humans, though. Pop over to Calais and see for yourself. They do really good and cheap cheese there too. Win-Win. Hey this is really fantastic, please write more about the struggle faced by refugees, you inspired me to write a small experience I had in Calais.